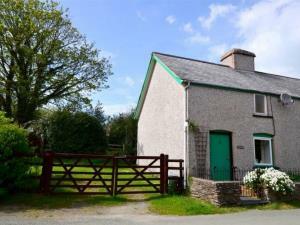 Moelfre Cottage01650 511 930work Self-cateringCharacter cottage, sleeps two adults and two children, in a quiet rural village amongst unspoilt countryside. Coast 14 miles. An ideal base for walking and exploring Mid Wales. Ideal base for walking - Glyndwr's Way Trail crosses our grounds... and a great place for mountain biking and exploring Mid Wales. We have history all around us: there is a 6ft Sanctuary Stone on one of our fields which is one of three in a triangle, that surrounds the Church. These stones are over 2000 years old. Nearby also is Bryn Crogwr, (translated- the Hill of the Hanged Man) which has wonderful panoramic views. Character cottage, sleeps two adults and two children, in a quiet rural village amongst unspoilt countryside. Coast 14 miles. An ideal base for walking and exploring Mid Wales. Shower and wash basin upstairs. There are two bedrooms: a double and a single, both with wonderful views. Bed linen provided. The fully equipped kitchen has microwave, cooker, fridge and six place settings. There is Sky digital TV in the lounge and a DVD Player The cottage has oil fired central heating, with radiators in every room. The garden has a barbecue, picnic table and bench so you can sit and admire the wildlife and views. A padlocked shed is provided for mountain bikes. Take the A489 from Cemmaes Road towards Machynlleth. Turn left for 3 villages - Darowen, Abercegir & Talywern. Travel through Abercegir, after 1 mile turn left up a steep hill to Darowen. Cottage is the first of three houses on the left, after the bungalow with a green door.